one of the two long ganglionated nerve strands alongside the vertebral column that extend from the base of the skull to the coccyx; they are connected to each spinal nerve by gray rami and receive fibers from the spinal cord through white rami connecting with the thoracic and upper lumbar spinal nerves. one of a pair of chains of ganglia extending along the side of the vertebral column from the base of the skull to the coccyx. Each trunk is part of the sympathetic nervous system and consists of a series of ganglia connected by various types of fibers. 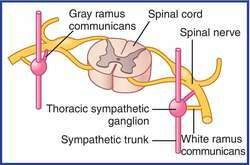 Each sympathetic trunk distributes branches with postganglionic fibers to the autonomic plexuses, the cranial nerves, the individual organs, the nerves accompanying arteries, and the spinal nerves. One of the two long, ganglionated nerve strands alongside the vertebral column that extend from the base of the skull to the coccyx; they are connected to each spinal nerve by gray rami and receive fibers from the spinal cord through white rami connecting with the thoracic and upper lumbar spinal nerves. Synonym(s): truncus sympathicus [TA] . pertaining to the sympathetic nervous system. trauma to the cervical spinal cord may be associated with bradycardia and hypotension. the sympathetic trunk whose ganglia suggest a chain of beads. a system of efferent dilator nerves distributed only to skeletal muscles; the existence of the system has been verified only in cats and dogs; in other species where it is not present vasodilation is achieved only by relaxation of vasoconstrictor tone. 1. see sympathetic trunk (below). the part of the autonomic nervous system whose preganglionic fibers arise from cell bodies in the thoracic and lumbar segments of the spinal cord; postganglionic fibers are distributed to the heart, smooth muscle, and glands of the entire body. the preganglionic fibers from the nerve cells in the thoracolumbar cord. two long ganglionated nerve strands, one on each side of the vertebral column, extending from the base of the skull to the coccyx. ganglia situated segmentally along the paired sympathetic trunks beside the vertebral bodies. Microscopic differences between the sciatic nerve and the thoracic sympathetic trunk in the dog. The sympathetic trunk and splanchnic nerves are commonly affected by anterior osteophytes of the vertebral column (Nathan, 1987). An Analysis of the Sympathetic Trunk and Rami in the Cervical and Upper Thoracic Regions in Man. Thoracic Sympathetic Trunk Compressions by Osteophytes Associated with Arthritis of Costovertebral Joint. Ganglia of the cervical part of the sympathetic trunk in the white rat, sources of blood supply and angioarchitectonics.